Do you want to directly print from your mobile/smartphone without transferring your images to a PC? If yes, then you would need the best 2×3 portable printers. A printer has not remained a luxury anymore. It has become an essential accessory for your computer or laptop. If you are into regular traveling, you would want to carry a printer along. Maybe you are on a travel and need to print a few photos rather instantly or have to take a print out of an important document. Portable printers can come quite handy in those circumstances. Today, we will take a look at the top picks for the best portable printers you can buy in 2019. Everything has become portable, and people perform most of their daily chores using smartphones and tablets. As such, the printers have also become portable. Now printers are not just confined to the room or office. We have mobile photo printers that will fit even in your jeans pocket. The market is flooded with 2×3 portable photo and video printers. In the end, you come out confused. In this post, we have a compiled a list of best Android and iPhone 2×3 portable color photo printers. These printers don’t use ink, Zinc inkless technology. Printing is quite easy; you have to charge the inbuilt battery, fit the slot with paper, connect with the phone and get color photos wherever and whenever you want in just a few minutes. A printer, like most other devices in the 21st century, has become all the more advanced and compact. They do not need so many connections and wires as they used to have a few years ago. The printers have become flexible and battery operated. From that perspective, we thought of checking out a few good printers you can buy in 2019. Kodak has been a massive name in the imaging industry. If printing photos on the move are what you are looking ahead for, the Kodak Mini Portable Photo printer should be the best choice for you. You can only connect your smartphone with the printer, and it will begin printing your photos instantly. The Android smartphone will need the Kodak app, while for the iOS devices, you will need to connect to the device using WiFi. The printer comes with thee D2T2 Dye transfer method for printing the photos. It also has a companion app that can be used to edit the images before you print them. Fade-proof printing technology ensures that your photos will stay intact with a shelf life of over ten years. Would you want to give a try? You may check the printer at this link on Amazon. The printer is capable of printing A4 sized documents on the move. The printer uses the MFI Bluetooth technology and thus should be a good option for printing right from your iOS device or Android smartphone. You also have access to a USB 2.0 connectivity option working with your PC if you so wish. The high capacity additional battery available as extra accessory sold separately that can offer you up to 600 pages on a single charge. Printing up to legal-sizes of papers. The printer comes with good quality output. It is a super portable thermal printer and offers an all-around performance. Did those features impress you? You can give it a try here on Amazon. The portable printers are primarily used for printing the photos on the move, and Pickit M2 can be a formidable choice from that perspective. The printer uses the dry sublimation technology for printing and thus ensures that the prints are saved for posterity. The printed images have a waterproof and fingerprint proof functionalities and thus have a better shelf life. Replacement of the paper and ink is rather simple and hassle-free. The printer comes with an NFC and WiFi connectivity option and thus should meet all your device requirements. The printer comes with a companion Pickit smartphone app for easy management. The compact size and light weight make it easy enough to carry anywhere. You can even share your photos from within the printer with anyone you want to. Interested in trying out the printer? You can gather more details from Amazon at this link. 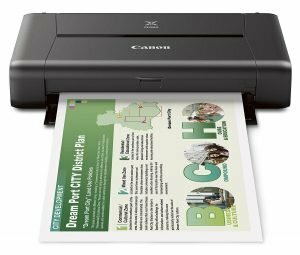 Convenience and superior image quality are what will make Canon Pixma iP110 one of the prime choices for the best in the category of portable mobile printers. The printer is capable of printing both photos and business level documents with ease and outstanding accuracy. If you are professional who is always on the move, the Canon Pixma is your best friend. 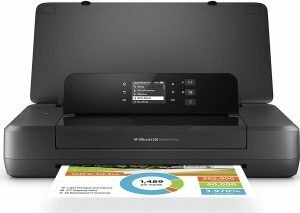 The printer can print wirelessly and effortlessly over a wireless connection with a maximum color dpi of 9600 x 2400. 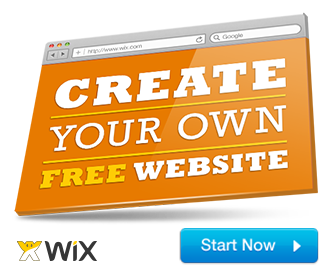 It can also print from select online cloud services without any difficulties. The Pixma iP110 supports documents of sizes up to 8.5 x 11 inches. The printer comes with additional features like WiFi an optional battery and PictBridge functionalities. It has the compatibility with both color or black and white prints. You can have access to attractive borderless printing for your creative needs. The Easy PhotoPrint+ lets you edit and print your photos from anywhere. In case you want to know more about the printer, you may find it here on Amazon. An upgrade to Instax SP-2, the new portable printer from Fujifilm lets you print your larger photos through a few simple configurations. You can even print photos from your social media feeds as well through the easy to follow steps. The printer lets you work with your smartphone over WiFi. The printer works the best with the companion app in the form of Instax SHARE app. It offers you the compatibility with both Android and iOS devices. It offers you a high-speed printing that takes just around 13 seconds to complete printing. You can print images from your social media feeds including Facebook, Instagram, and other networks. The printer also can also be used to print photos directly from your Fujifilm camera. It can print on square format analog film. Amusing features, right? Know more about it from this link from Amazon. Designed specifically for the natural portable printing ability from wherever you are, the HP OfficeJet 200 Portable Printer offers you exceptional performance characteristics. Outstanding print quality is what will make it a great choice. Reviews have suggested that the printer is even capable of excellent performance than even the inkjet printers. It also promises a faster printing performance. It can connect to your devices with just a WiFi connection. The HP printer app should be helpful in setting up and working with your prints. It supports a wide range of photo sizes. Unique technology to achieve excellent print quality. The easy portability of the printer should make it an excellent option. The WiFi and USB 2.0 connectivity will make it a formidable choice for connectivity. Extended lasting battery ensures that you have no interruptions concerning charging and printing. Want to check it out? You should be able to check it out at this link on Amazon. The serene life portable instant photo printer is an excellent option for printing your photos and other documents seamlessly over wireless from your Android and iOS devices. The inbuilt battery is capable of printing around 25 images on a single charge. The maintenance is easy as you can eject the cartridge and replace the new one right away. The printer can print photos in 2 x 3.5 inch and offers you borderless and high-quality images at 291 dpi. The compact size makes it one of the best options to fit inside your shoulder bag. The printer comes with a mobile app for easy management of your prints and printer. The portable design makes it a practically good option for fitting inside your pocket. The complete borderless prints should make it a good choice for the needs in quicker ID prints. The accompanying mobile app helps you edit the images before you print them. Wasn’t that an exciting and impressive option? You can get to know more about it on Amazon. 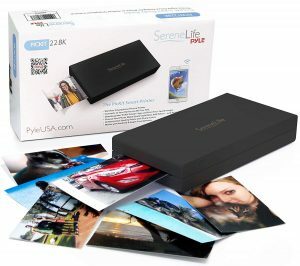 The Lifeprint 2×3 Portable Photo and Video Printer is perhaps the world’s first sharable photo printer. You can use the printer for sharing your images with your Lifeprint friends all around the globe. The printer also lets you pull your favorite images from the social media networks like Facebook, Instagram, and Snapchat to name a few. The portable design makes the printer the best option for the parties, events and other similar occasions. The printer provides you an Augmented reality functionality for an added advantage. There is an accompanying image editor suite to add filters, text, memes and other options. ensures there is no smudging. 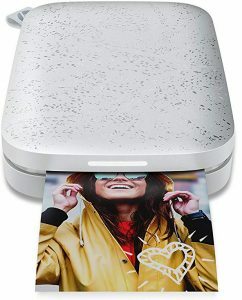 If those features impress you enough, you may find more about the photo printer at this link on Amazon. The printer with a smartphone size, the HP Sprocket Portable Photo Printer should be your best to print those images right away. Share your adventures easily. The printer slips into your locket right away. The printer can connect with multiple devices simultaneously, thus allowing you and your friends to print together. The printer also supports augmented reality to view the print jobs in a queue. The accompanying HP Sprocket app helps you manage your printer and prints. The Bluetooth connectivity stays always connected and offers you a consistent performance without the need for the hassles pairing over and again. The HP Sprocket app also lets you customize your prints with your exact needs. The ZINK Zero Ink compatibility ensures it avoids smudging. You can check out the additional features from this link on Amazon. 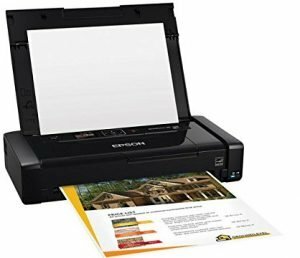 The Epson WorkForce WF-100 Wireless Mobile Printer has been around since quite long but has managed to live up to the expectations. It has been able to beat the competition with its functions and features. The printer is slightly larger but offers a lightweight design. You can use it for printing right from your PC or even from your Android or iOS smartphones. It can print both in color or black and white. The printer should be the best option for the professionals who are always on the move. The printer is perhaps the lightest and most portable printer you can go for. The printer comes with built-in support for Wireless and WiFi Direct. Flexible battery charging for your requirements. The printer can print both your documents and photos with ease. If those features impress you, it may be a good idea to check out the printer at this link on Amazon. Most of the printers here use the peel and stick paper cartridge. After printing the image, you can peel the back layer, and it will work like a sticker via the adhesive coating. You can click photos at the moment, edit, print and stick the pictures on your wall in just a couple of minutes, and that is where the beauty of portable images comes into play. 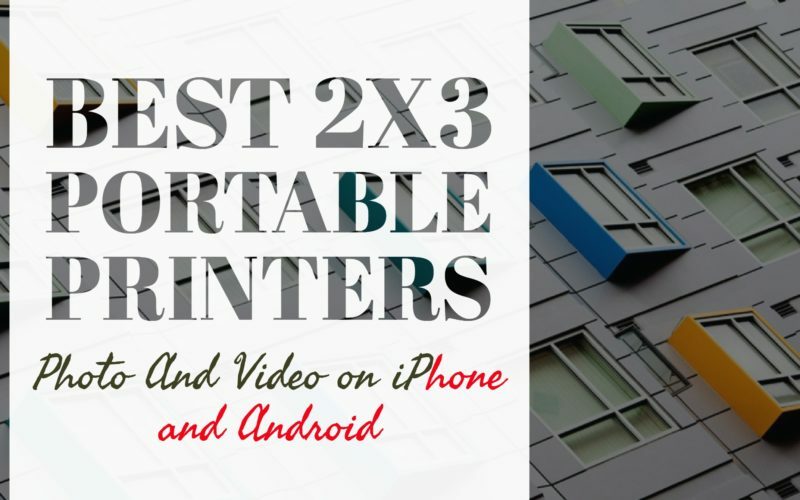 Let’s jump on to the list of best 2×3 mobile photo and video printers for iPhone and Android smartphones. SereneLife Pickit 20 is an affordable portable printer that fits anywhere, about the size of a cellphone. To customize your photos you can download the Pickit app. This smart 2×3 photo printer will let you make your memorable moments scrapbook quickly. In a single charge, it will print around 25 photos. Recharging the inbuilt battery takes only half an hour. Don’t fuss with ink or paper. You can quickly change ten piece cartridges that are self-contained preventing unwanted fingerprints and hassles with cleaning or maintenance. This mobile phone printer produces high quality fully laminated 291 dpi of glossy images. It supports JPEG and PNG file format; you can print from the iOS and Android devices with photo dimension of 2.1 x 3.4 inch. It comes with the 1-year limited warranty from the manufacturer. 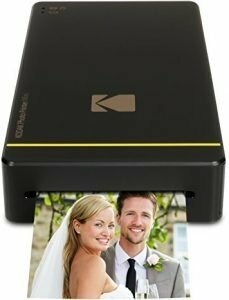 Kodak Mini portable is best 2×3 photo printer for Android and iOS devices under $100. It used advanced DyeSub printing technology. As a result, image prints are beautiful and detailed that dry instantly and last long for up to 10 years. You can connect your smartphone using the WiFi and NFC and get your pictures in just a moment in your hand. It supports JPEG image format prints from the iOS and Android devices. Refilling the ink and paper cartridge is always a hassle, but that’s not the case with this photo printer. You can edit your pictures right from your smartphone and get a preview of what is going to be printed on the paper. Free Kodak app, customize your photos with filters and templates, edit images and adjust the dimensions and much more. With the central unit, you will also get a micro USB cable and one photo cartridge. This printer weighs 238 grams and comes with one-year warranty support from Kodak. 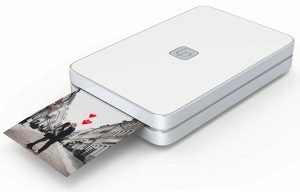 If I have to choose the best looking portable 2×3 photo printer without compromising with the photo quality, Lifeprint printer will be my pick. Lifeprint uses the Augmented Reality Hyperphotos that make your photos come to life like the real portrait of you. Its share feature is fantastic. You can easily connect with your Lifeprint friends and share actual images directly to each other’s printers across the world. You can print snaps from Facebook, Instagram, moving GIFs and more. It comes with a full photo editing suite that will let you add, filters, text, memes, stickers, and more. The paper used for printing photo is sticky. You have to peel the back layer of your photos, and you get the stickers that can be used for decorating walls. It uses the Bluetooth connection to connect to the smartphones and works up to 30 feet range in the open. It works fine for most of the Android and iOS devices. But you must check on their website to whether it is compatible with your device model. 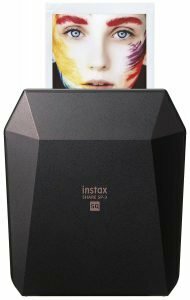 FujiFilm Instax SP-2 prints high-resolution images of 800×600 pixels per inch with 320 DPI to show the detailed gradations, facial expressions, and characters quickly. A new laser exposure system achieves a faster printing speed as compared to the other 2×3 portable photo printers of this price range. It takes around 10 seconds to give the output print from the time of print data transfer. The rechargeable battery that charges via the micro USB port provides average backup as expected from the portable photo printers. You have to connect the SP-2 to the smartphone via WiFi connection. Instax Share app is free to download, provides plenty of advanced photo editing settings, frames, templates and much more. A line of LED lights are on the top, that indicates the film and battery status. There is a physical button also to share the same print with others. The Instax technology used by the Fujifilm develops excellent colors that don’t fade away over the years. It is available in gold and silver color, both looks astonishing. Let me be frank with you; this one is my personal favorite in this price category. HP is a big name in the printer market. HP Sprocket is the proof, why HP is so famous when it comes to the printers. Sprocket is a photo printer for fun on the go. You can print your 2×3 photos anywhere anytime you want all you need is a smartphone and Sprocket photo printer. It uses the Bluetooth connection to pair up with your smartphone. HP Sprocket App is must to print the photos directly from your smartphone that can be iOS and Android-based devices. Sprocket app has a lot of features that come handy like you can connect all your social media accounts to this and print images from there. It uses HP ZINK photo paper, thanks to them you get the bright, glossy photos every time. With the printer, you get ten sheets of HP Zink 2×3 photo paper with the peel and stick backing for instant photo stickers and a micro USB cable for charging. 1-year limited hardware warranty backs it. The Selphy CP1200 photo printer comes with advanced functionalities and a slightly higher price. Canon Selphy CP 1200 is a wireless printer that is not an entirely portable printer. Means it has got the battery so you can carry it along with you and print wherever you want to. But the problem is its size. You need a backpack to carry it safely. It is not like the other printer throw them in the bag and go. It has a lot of types of equipment that needs to be handled with care. Then why should you opt for this printer? Just because of the features and print quality it offers at this price. It has a 2.7-inch tilt-up LCD to quickly view, select and edit images for computer-free and straightforward printing. There is a dedicated WiFi button allows quick and easy distribution from your wireless network. With AirPrint, you can print wirelessly from your iPhone or iPad. Selphy App that can be downloaded free of cost provides plenty of photo editing and synchronizing tools with various devices and social media platforms. You can even directly from the memory cards or pen drive using the USB port and built-in card slot. Just select the images on the LCD and press print! As simple as that. The inbuilt battery in this printer gives out the most copies in one charge, which is 54 prints as compared with the others here. In the package, you will get Selphy CP1200 printer, paper cassette (postcard size), compact power adapter, Canon KP-108IN Color Ink Paper Set, Xtech hard case, USB printer cable for PC connection & cleaning cloth. Plus, one year warranty and 24/7 technical support from the Canon. If you could handle its comparatively large size, this is the best semi-portable 2×3 photo printer with best in class picture print quality. If you are not aware of what you are looking for, it isn’t that easy to find the best portable printer for your requirements. You have several brands and models available with varying features, but some of the printers have seen to come with excellent features. We assume that the reviews of the top ten printers we have listed here should help you find the best options available for you. Have you used any of the portable printers we have featured in this compilation? If you have any experiences or opinions about the printers we have shared here, do let us know of your views through the comments here. Most of these printers can print and share 2×3-inch photo snapshots or stickers from your favorite iOS or Android devices. These are lightweight & portable photo printer which can comfortably fit into a pocket or a backpack. Even though their capacity is limited, they will do just fine for light usage. We hope you like our list of the Best 2×3 Portable Printers currently available on the market. Comments or suggestions are welcome in the comment section below. Cheers!